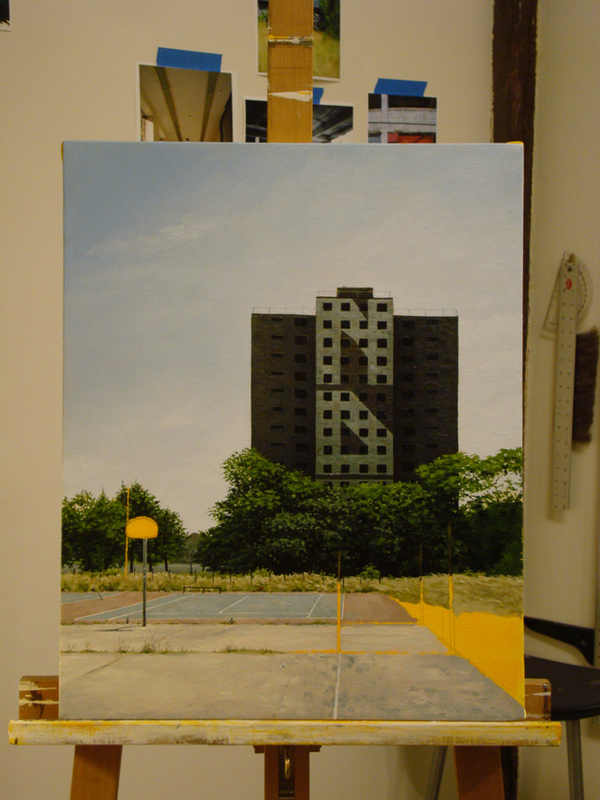 Stephanie Buer: This is a piece I did of the now vacant Brewster-Douglass Housing Projects in Detroit. It’s actually a compilation of two different trips, the first time I photographed, the buildings had not been painted and the second time I went they had and I loved things about both trips so I combined them. The original sold at a show with Thinkspace Gallery in Philadelphia at Gallery 309. Stephanie Buer: This piece was created in the summer of 2013, so not that long ago. The original painting was created using oil on canvas. 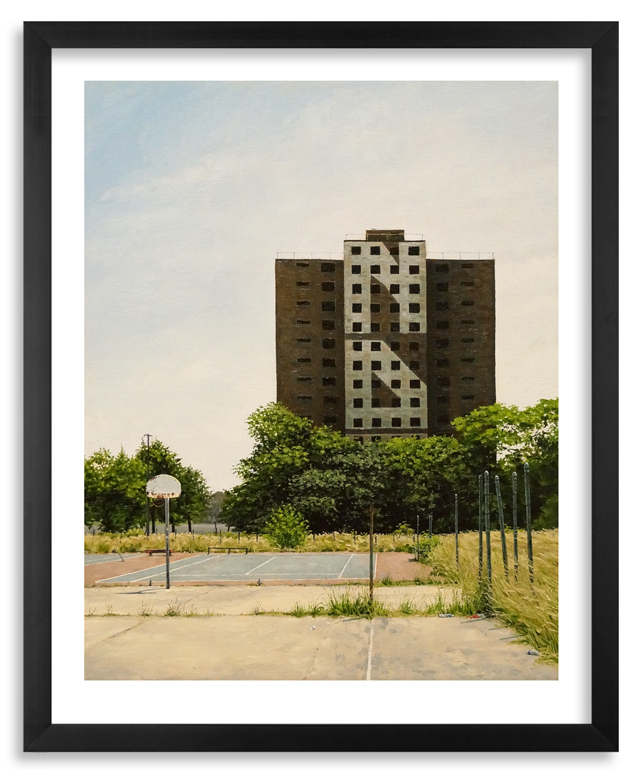 Stephanie Buer: This is one of many ongoing pieces about the city. Detroit is a unique place, with a deep history, whether it is glamorous or not, I choose to focus on the less fortunate areas, as I think they tell an important story about a place in transition. Stephanie Buer: The idea came about as most of my pieces do. I wander around the city, this one happens do be in Detroit where I lived for some time, and I find places I love and take photos of things I find beautiful or interesting. It’s sort of a wandering, intuitive way of finding inspiration. Then I take the images back to my studio and work with whatever inspire me at that time or I think would work well for certain shows. 1xRUN: How long did this series take? 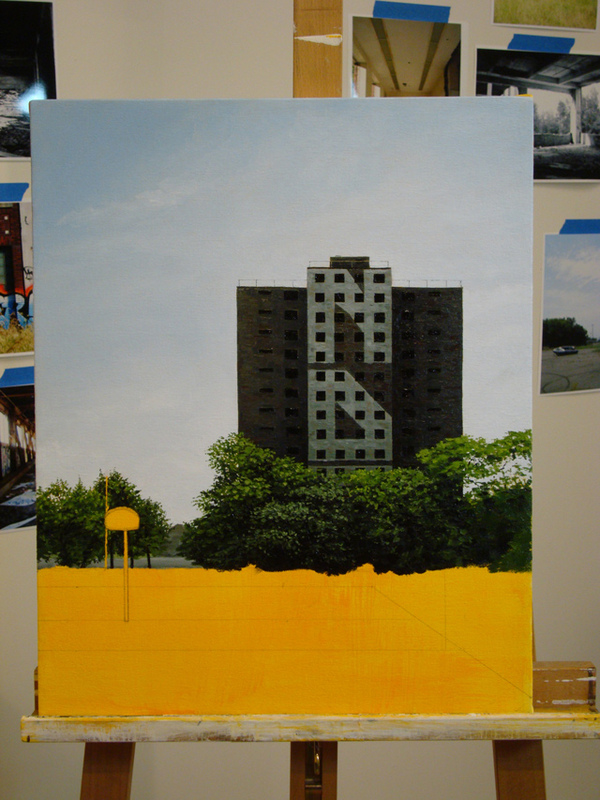 Stephanie Buer: I’ve been working on my paintings/drawings full time for about two years now, its sort of an ongoing series about urban spaces. This particular painting took about 40 hrs. 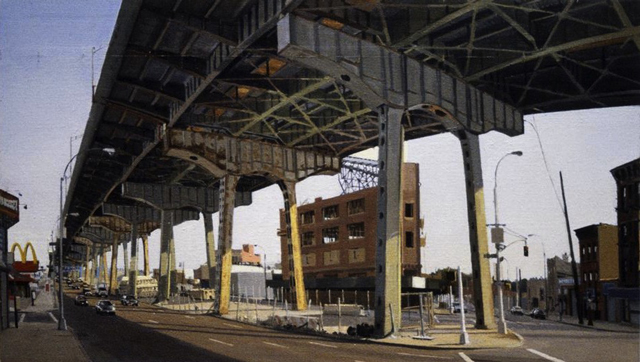 Stephanie Buer: I think that focusing on the overlooked areas of our cities, the areas that most people would deem an eyesore and a nuisance, and then spending so much time and energy capturing them, and recreating them in a classical medium, makes them unique. I also enjoy the absence of people, I can’t quite explain the reasoning but I enjoy that. 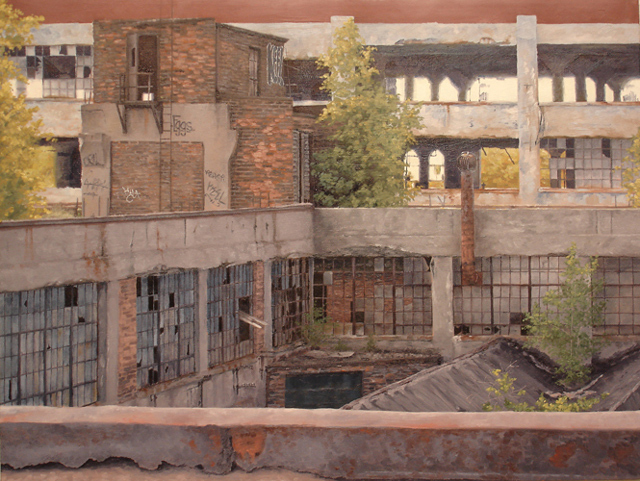 Stephanie Buer: This piece is particularly special in that these buildings are in the process of being taken down. A piece of Detroit history, for better or worse, will be lost forever; I feel very fortunate that I was able to capture it in that specific state, at that time. I’m glad it will live on in a small way. At least that would be why I would want to buy it. 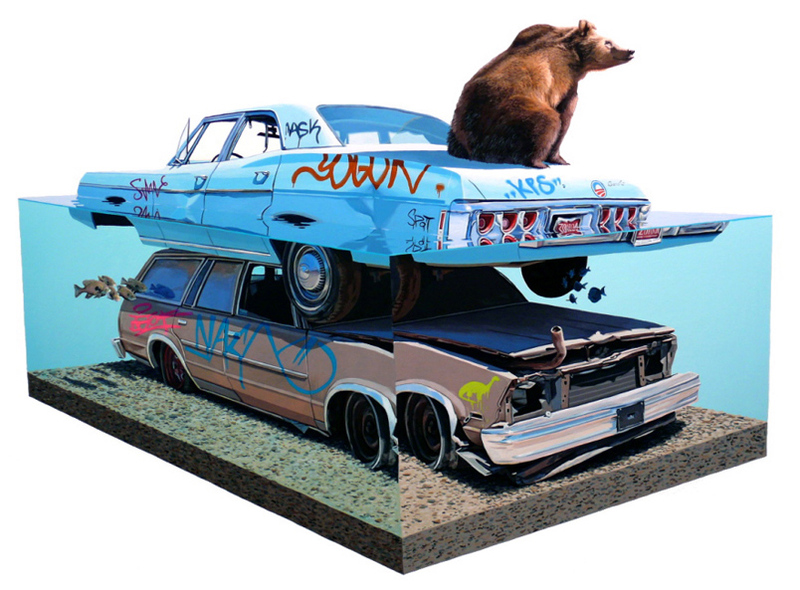 1xRUN: Describe these pieces in one gut reaction word. Stephanie Buer: I’ve always drawn, since I was a kid, but I suppose I didn’t start taking it seriously until I was in college. 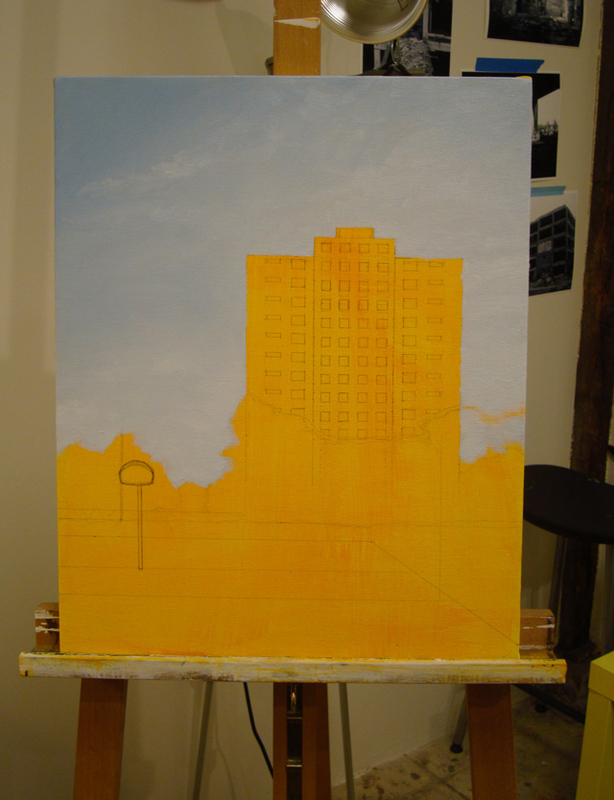 My first piece in this urban series was for a landscape drawing class I took at CCS in Detroit. I had been exploring for years, but I didn’t start using that as inspiration in my work until that time. I think I was a Junior or Senior in College. 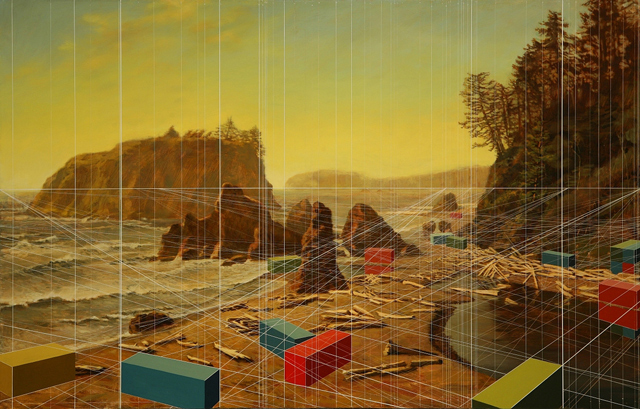 Stephanie Buer: I really loved the work of Rackstraw Downes, and Andy Goldsworthy and before that, in late High School I was obsessed with late Pre-Raphealite artists like Waterhouse. Now the internet makes it so easy to look at so much work all the time. Its crazy. So with that being said, its really hard to pick, I’m inspired by so much from so many different parts of the art world. I particularly like the work of Jeremy Geddes, Henrik AA. Uldalen, Alex Roulette, Alex Lukas… such great stuff! Stephanie Buer: I often do, I become obsessed with certain artists or albums and listen to them non stop. At this particular moment its anything Philip Glass, and the new album by Washed Out, Paracosm. I really like working in a busy, social environment. I find it very inspiring. I work in a space with 8 other artists, and many more down the hall, they’re all really fantastic. When we get tired of working we have meals together, share music, or play video games. Its really a great environment, I’m incredibly lucky. Stephanie Buer: Well, I have a show coming up next August with Mary Iverson, who’s work I just love and we’ve been throwing around some ideas. I think that would be pretty awesome. For the latter, I’m not sure it would make a great collaboration but I’d love to paint with Sargent, or maybe just sit and watch him paint. That would be cool. 1xRUN: What was the first and last pieces of art that you bought? Do you still have them? Stephanie Buer: I actually bought my very first piece of art not that long ago. Its a beautiful floral drawing by Fumi Nakamura. My first print though, was a Josh Keyes, I bought it as a birthday present for my then boyfriend, now husband, about five years ago. I still have and love both pieces! The last was a print by a fantastic pair of artists living and working here in Portland OR. They’re a husband and wife team called, APAK. I just love their work!